The Best Hindu blogs from thousands of top Hindu blogs in our index using search and social metrics. Data will be refreshed once a week. Also check out Hindu Podcasts. Hindu newsletter is a comprehensive summary of the day's most important blog posts and news articles from the best Hindu websites on the web, and delivered to your email inbox each morning. To subscribe, simply provide us with your email address. San Francisco, CA About Blog The oldest living religion. Welcome to the Hinduism subreddit. You'll find the need to know on Hinduism here. Facebook fans 1,034,504. Twitter followers 447,231. Pune, India About Blog Hindu Blog is an online magazine that updates regularly about matters related to Hinduism (like festivals, astrology, temples, sacred places, fasting, rituals), the latest developments in Hindu society and religion and explores Sanatana Dharma (Hinduism). An attempt to learn the true teachings of Sanatana Dharma. Facebook fans 30,051. Twitter followers 2,100. About Blog Hindu Janajagruti Samiti (HJS) was established on 7th October 2002 for Education of Dharma, Awakening of Dharma, Protection of Dharma, Protection of the Nation and Uniting Hindus. Our mission is to create awareness about Hindu issues, to Educate about Hindu Dharma, to unite Hindus globally , to achieve broader social interests instead of their narrow-minded power centric Hinduism. Facebook fans 14,550. Twitter followers 18,585. India About Blog Hindu Devotional Blog is a spiritual website dedicated to Hinduism, Hindu festivals, rituals, temples, and pilgrimage destinations. Also get Hindu mantra lyrics in various Indian languages. Facebook fans 12,597. Twitter followers 4,451. About Blog Sound carries consciousness. Pure spiritual sound awakens the original consciousness of the soul: Krishna Consciousness. Our mission is to keep pure spiritual sound going and to broadcast it as far and wide as possible. Hawaii, USA About Blog Hinduism Today is Sanatana Dharma's flagship religious magazine, recording the modern history of a billion-strong global religion in renaissance. Our mission is to foster Hindu solidarity as a unity in diversity among all sects and lineages. To inform and inspire Hindus worldwide and people interested in Hinduism. To protect, preserve and promote the sacred Vedas and the Hindu religion. Facebook fans 67,589. Twitter followers 19,625. London.UK About Blog Latest Hindu News Updates Covering Human Rights Abuses of Hindus, Defamation Against Hinduism, Hinduphobia and much more. Facebook fans 139,755. Twitter followers 896. Gainesville, Florida About Blog The information presented on Krishna.com is based on sacred texts including the Bhagavad-gita, Srimad-Bhagavatam, Chaitanya Charitamrita and related Vaishnava scripture. We also facilitate the Internet distribution of spiritual literature published by the Bhaktivedanta Book Trust (BBT). It is the world’s largest publisher of ancient and classic Vaishnava texts centering on Sri Krishna’s teaching. Facebook fans 7,722. Twitter followers 5,683. Kapaa, Hawaii, USA About Blog A Hindu monastery-temple complex in Hawaii of the Tamil Saivite tradition, home to two dozen monks, pilgrimage destination for sincere devotees, highly respected producer of contemporary, world-class, Hindu religious publications. Our mission is to train renunciate monks who live under formal vows, providing them the opportunity to perform advanced sadhana under the guidance of a satguru. Facebook fans 41,436. Twitter followers 1,884. United States About Blog Blog by Pradeep Sanatan.He Spread awareness of truth including Sanatan Dharm and Hinduism Cosmos, Ancient Hinduism science. Facebook fans 26,569. Twitter followers 4,179. Facebook fans 11,605. Twitter followers 10,184. California About Blog Vedic astrology, or Jyotish, originated in India thousands of years ago. It ultimately provides us with a deeper understanding of the intricate aspects of ourselves through a fuller appreciation of our destiny. The word Vedic is derived from the Vedas, the world’s most ancient books of knowledge from India. Veda means “wisdom”. Facebook fans 2,655. Twitter followers 2,385. About Blog The blog explains why Sanatana Dharma is the natural choice of programmers, designers, and creators of all kinds, when adopting a world view from the many we inherited. Maryland, U.S. About Blog The journey of an American convert to Hinduism. Here you will find information about culture, ethnicity, identity, labels, religion, and language. You will read general information about Hinduism and details about different ways of looking at conversion. Facebook fans 3,895. Twitter followers 1,923. London About Blog Latest news and features from theguardian.com on Hinduism, the world's leading liberal voice. Facebook fans 6,691,056. Twitter followers 6,083,155. About Blog Divya Bhumi site provides stories of various victorious hindu warriors, life hacks, pooja articles and much more. India About Blog Mantras for health, wealth and love. Mantras are predetermined tools that are designed to attract specific benefits your life, from protection, health, love and material prosperity. Find what they do. About Blog Suddh News is an spiritual website dedicated to Hinduism, Hindu festivals, rituals, temples, and pilgrimage destinations,Hindu mantra. Facebook fans 2,925. Twitter followers 96. About Blog Srimad Bhagavatha dharma holds one falling, purifies, removes difficulties, bestows prosperity, makes virtuous & leads to the Lotus feet of Lord with moksha. Being at the brink of devotion, I seek the shelter of Guru Raghavendra. Praying to Mukya Prana, & Paramatma residing in all beings to originate the words of Srimad Bhagavatha Mahatmya as flowers, to offer the same to the Lotus feet of Sri Krishna. About Blog Progressive Hindu Dialogue is an initiative to explore, recognize and advance the rational, liberal and progressive nature of Hinduism. Leafy Hertfordshire About Blog Contemporary practice of the teachings of Bhagavad-gita. I considerthe spiritual teacher who created the international Hare Krishna movement, bringing the Vaishnava tradition from India and offering it to the rest of the world. He writes to give companionship to his students and friends who have gladly accepted what Srila Prabhupada offered. Blog by Kripamoya Das. New York, New York About Blog Dandapani is a Hindu priest, speaker on self development and an entrepreneur. Teaching simple practical spiritual tools that are easy to implement in every day life to bring about a personal change that can be sustained. Facebook fans 2,463. Twitter followers 1,493. India About Blog Welcome to my pooja box No matter how modern we become, it is our roots, tradition and customs that keep us attached to our soil. Our aim is to make pooja ceremonies an auspicious, spiritual and enjoyable experience. Facebook fans 133,790. Twitter followers 117. About Blog The Vision of Perth Hindu Temple is to enhance the religious experience for all in our diverse congregational community. The temple will strive to conduct religious, spiritual, educational, social and cultural activities for the benefit of the Hindu community and the wider interested audience. Facebook fans 7,886. Twitter followers n/a. India About Blog A Blog about Religious Hindu Philosophy of Bhagwat Gita or Bhagwad Gita or Gita, Geeta : Teachings of 'Lord Krishna' given to 'Arjuna' on the battlefield of Kurukshetra during Mahabharata in Haryana State of India, more than 5000 years before. How these philosophies / teachings are still relevant in modern day to day life of today, shall be there in this blog. Facebook fans 12,568. Twitter followers 2,671. About Blog Kaulantak Peeth Nepal Blog describes everything about kaula, kaulantak peeth, mahayogi, maryada, rules, tantra, kundalini and much more. Facebook fans 62,724. Twitter followers 1,944. Brahmand About Blog This blog includes latest updates on Hindu, India, Hinduisum, Islam, Terror, Vedant, Sanatan Dharma Poetry. Washington D.C. About Blog The Hindu American Foundation (HAF) is an advocacy organization for the Hindu American community. The Foundation educates the public about Hinduism, speaks out about issues affecting Hindus worldwide, and builds bridges with institutions and individuals whose work aligns with HAF’s objectives. HAF focuses on human and civil rights, public policy, media, academia, and interfaith relations. Facebook fans 14,250. Twitter followers 7,870. Preston, England About Blog Our Vision is to maintain and promote the Hindu Dharma and cultural heritage in order to enrich the lives of people in the Hindu and wider communities, now and in future generations. Our mission to cater for, and service the needs of, all sectors of our local community by providing a wide range of activities and opportunities for individuals and groups. Facebook fans 353. Twitter followers 12. Kolkata, India About Blog Amarpujo share some interesting facts about Hindu Mythology. Durga puja festival In Kolkata, Photos, Videos, Blogs, Durga Puja is the most important festival of Bengal. Durga Puja means more to us than just a religious festival.It is a celebration of life, culture, popular customs and traditions. Facebook fans 4,620. Twitter followers 102. 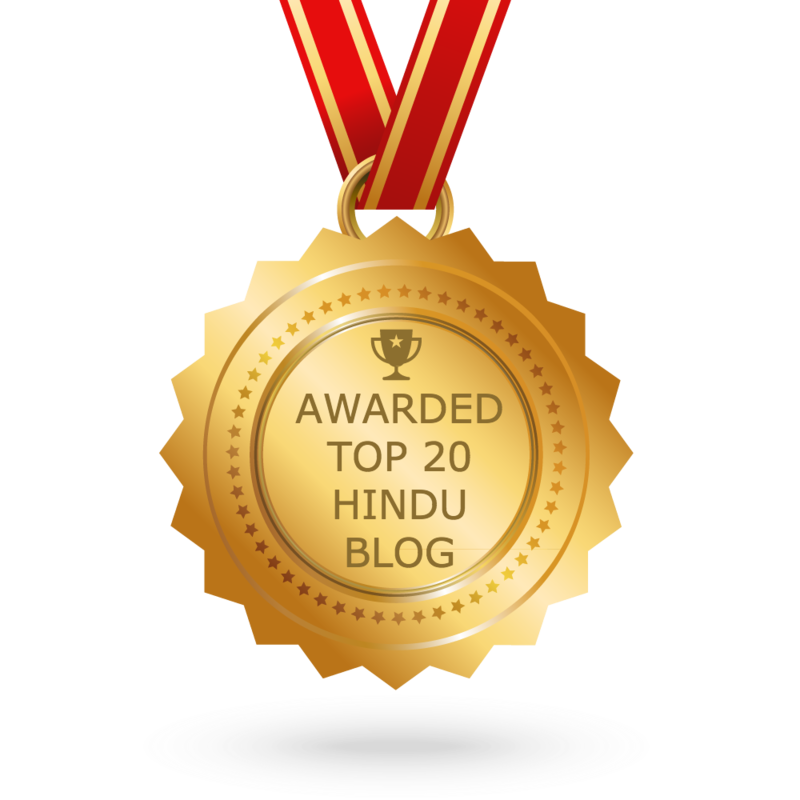 CONGRATULATIONS to every blogger that has made this Top Hindu blogs list! This is the most comprehensive list of best Hindu blogs on the internet and I’m honoured to have you as part of this! I personally give you a high-five and want to thank you for your contribution to this world.